The Nvidia GeForce GT 120M is a DirectX 10 graphics card for notebooks and technically a slower clocked GeForce 130M GT with a lower current consumption. The performance should be on a level with the older 9600M GT. As the 9600M GT it features the PureVideo HD video processor (VP3) and HybridPower support. In conjunction with the Nvidia 9100M G integrated graphics, the GT 120M supports Hybrid-SLI (only HybridPower). HybridPower is a technique to choose between the integrated and dedicated graphics core, if performance or battery runtime is needed. This works only in Windows Vista. Up to now the user has to use a tool to switch between the GPUs. Later Nvidia wants to switch automatically in the drivers. GeForceBoost is not supported with this card, as there would be no performance gain. As the 130M / 9600M GT, the GT 120M features 32 stream processors that do the graphic work of the vertex- and pixel-shaders. The performance of the GT 120M should be somewhere near the 9600M GT. Therfore, high end games like GTA 4 and Crysis wont run in high settings, but less demanding games (like Lef 4 Dead) should run fluently in high settings. PhysX is only supported when two GeForce GT 120M are used in SLI mode (one GPU dedicated for PhysX) as the alone 120M is not powerful enough to calculate both graphics and PhysX. Compared to desktop graphics cards, the GT 120M is similar to the GeForce 9500GT or GT 120 (which also descend from the G96 core). Still the desktop cards should be a bit faster. The Nvidia GeForce GT 130M is a DirectX 10 graphics card for notebooks and technically a higher clocked GeForce 9650M GT with a lower current consumption . It is produced in 55nm and the current consumption is similar to the 9600M GT which is produced in 65nm. As the 9600M GT it features the PureVideo HD video processor (VP3) and HybridPower support. 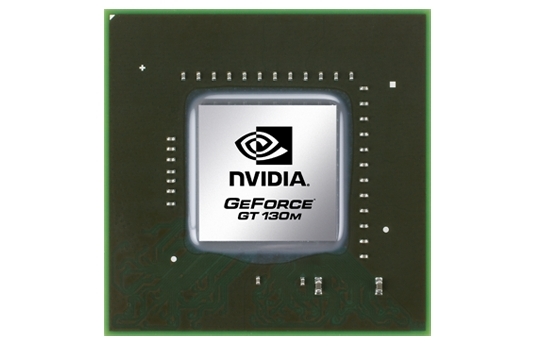 In conjunction with the Nvidia 9100M G integrated graphics, the GT 130M supports Hybrid-SLI (only HybridPower). HybridPower is a technique to choose between the integrated and dedicated graphics core, if performance or battery runtime is needed. This works only in Windows Vista. Up to now the user has to use a tool to switch between the GPUs. Later Nvidia wants to switch automatically in the drivers. GeForceBoost is not supported with this card, as there would be no performance gain. As the 9600M GT, the GT 130M features 32 stream processors that do the graphic work of the vertex- and pixel-shaders. The performance of the GT 130M should be somewhere near the 9650M GS. Therfore high end games like GTA 4 and Crysis wont run in high settings, but less demanding games (like Lef 4 Dead) should run fluently in high settings. PhysX is only supported when two GeForce GT 130M are used in SLI mode (one GPU dedicated for PhysX) as the 130M is not powerful enough to calculate both graphics and PhysX. Compared to desktop graphics cards, the GT 130M is similar to the GeForce 9500GT or GT 120 (which also descend from the G96 core). The desktop CPU GeForce 130 has a wider memory bus and more pipelines.